The BBC is reporting a bizarre and grisly crime, that took place in Kent, England. 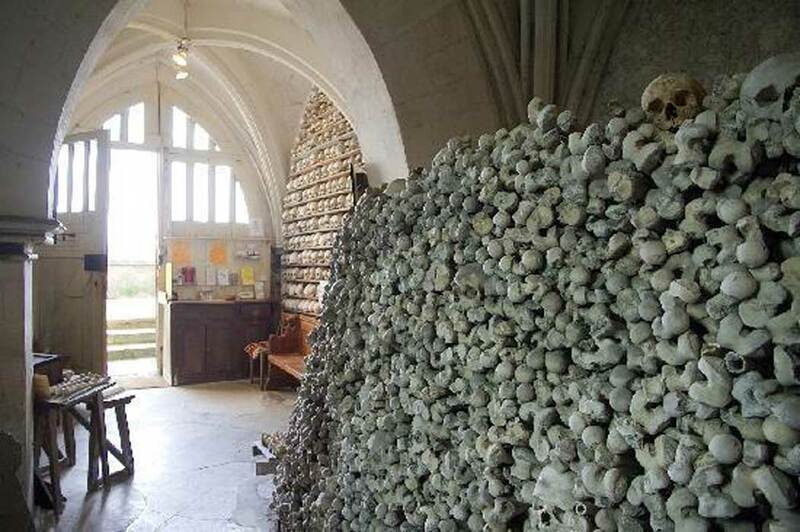 Thieves have stolen some 21 human skulls from St Leonard's Church in Hythe, Kent. They were stored in a charnel house in the crypt of the Church, where they have been housed since the Middle Ages. The theft has shocked the local community and angered many. The church of St Leonard is well-known in the area and, according to Breaking News , it is often simply called ‘the church with the bones’. It sits above the picturesque seaside town of Hythe. The church dates back almost a millennium and possibly goes back to Anglo-Saxon times. What makes it unique is its crypt, which has a charnel house, where over 1000 skulls and other bones that are between 600 and 1000 years old are kept. These are believed to be the remains of long-dead Hythe residents and to have come from churches and graveyards that were closed centuries ago. Once nearly every church in England had a crypt where bones were stored. Based on medieval Christian teaching, cremation was unacceptable, so the bones of the dead were kept as it was believed that some physical remains were needed so that people could be resurrected on the Day of Judgement. Many Charnel Houses were destroyed during the Reformation and why the one at St Leonard’s survived is not known. According to the BBC St Leonard’s has the “largest and best-preserved collection of ancient human skulls and bones in Britain”. Many of the skulls are kept on shelves and the collection includes a stack of skulls and bones which is 8 meters (25-foot) long and 1.8 meters (6 feet) wide and high. The skulls were taken from the crypt after the thief or thieves cut a lock on a door. Local police have begun an investigation and have condemned the burglary, which took place sometime between Sunday night and Monday afternoon. Police have appealed to the local community for any information and asked for witnesses to come forward. Breaking News reports that Police Inspector, Maxine Harris stated that the human skulls were “not free for the taking” and that that the theft was being treated very seriously. The thieves did not steal anything else, even though there was a small sum of money in the Church. Furthermore, they came with equipment to cut the lock of the charnel house door. Investigators believe that the thefts of the skulls were not carried out by teenagers but rather by experienced criminals. There is speculation that the thieves may try and sell the medieval skulls on the black market to unscrupulous collectors of historic items and artifacts. The Diocese of Canterbury has also condemned the burglary. The diocese is very proud of the church, with one of the last remaining charnel houses in England . The collection of neatly stacked bones and skulls are on public display and anyone can visit the charnel house. The diocese never imagined that the skulls would be stolen. The theft of the 21 skulls is unsettling. Not only does it show great disrespect to the church but also to the dead. The robbery of the skulls from the collection of St Leonard’s is a great loss to the local community. The charnel house is an important part of the heritage of Kent and it is hoped that the skulls will be recovered and returned to St Leonard’s. Because of the burglary, the church is now purchasing a sophisticated security system. Thankfully, the public will still be able to visit the charnel house with its remarkable collection or bones.